I worked together with the California Raisin Marketing Board to create this recipe and was compensated for my time. The opinions below are mine and mine alone and do not represent those of the California Raisin Marketing Board. The genius for this sauce comes from Oaxaca, a city located about 300 miles south of Mexico City. Rich in history and culture, Oaxaca is a fascinating city where you can appreciate ancient civilizations, colonial art and architecture and vibrant cultural traditions. The area is also known for its spectacular culinary gifts to the world, and I am not just talking about the variety of mole sauces. 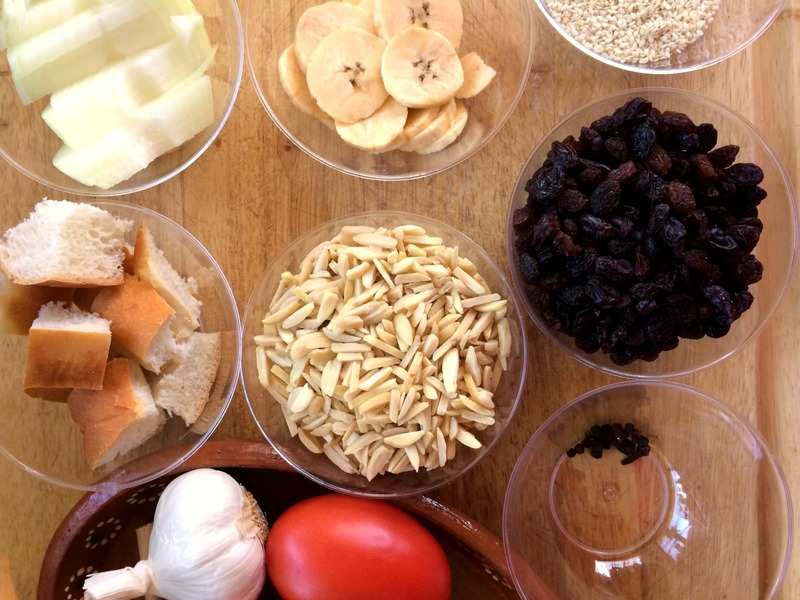 I was drawn to this recipe because of it’s creative use of raisins. I like when sauces have layers of flavor that range from savory to sweet. That’s the beauty of some of the mole sauces from Oaxaca. The almond “nutty” flavor definitely dominates this sauce, but you also taste sweetness from the pureed California raisins. I love how the notes of cinnamon and cloves warm the mixture and give a nod to Mexico’s marriage with foods from Arab and Spanish influences. The creaminess comes from the plantains, almonds and chicken broth. Although this recipe seems a bit daunting to new cooks as there are a number of steps, if you layout all the measured ingredients and cooking utensils, you’ll find that it is really quite simple and like me will be making this sauce over and over again. Quick note on the olives and chiles. The green olives and sliced pickled jalapeños are important ingredients for this dish as the vinegar lifts the sauce and balances the sweetness beautifully. For the chicken: Pour 8 cups of water into a large stock pot, add the onion, garlic, and a pinch of salt, and bring to a boil. Reduce the heat and simmer for 5 minutes. Add the chicken and simmer for about 25 minutes or until just tender. Remove the pan from the heat and lift out the chicken. Strain the cooking liquid into a mixing bowl and reserve. To make the sauce: Put the tomatoes into a saucepan and add enough water to cover, and bring to a simmer. Cook for about 10 minutes until soft, being careful not to let them burst. Remove the pan from the heat and drain. Put the tomatoes into a food processor or blender and process to a puree. Transfer to a bowl. At this point, I would make sure to have all the rest of the ingredients ready to go. Heat 1 tablespoon oil in a frying pan. Add the garlic, saute for a minute until slightly brown, then add the California raisins, almonds, onion, plantain, and brioche to the pan and saute for several minutes until fragrant. The mixture will be thick so add a bit more oil if necessary. Transfer to a plate and set aside. In the same frying pan, add the sesame seeds and toss in the hot pan until a deep golden brown. Set aside. In a blender or food processor, add the cinnamon, cloves, peppercorns, parsley, and 2 cups of the chicken broth to combine. With the motor running, add the sesame seeds and process until the mixture is fairly smooth. This takes a good 3 minutes. Add another cup of broth to the blender, then add all the ingredients and pulse until combined. Add more stock as needed to make a thick, creamy sauce. You want the sauce to stick to the back of a spoon, but still pour-able. Heat 3 tablespoons oil in heavy saucepan. Add the contents of the blender and cook for 5 minutes, stirring occasionally to prevent it from sticking. Add a bit more liquid, if necessary. Stir in the pureed tomatoes and continue cooking for about 8 minutes, until the mixture has reduced and thickened. Stir in the remaining broth and simmer for another 10 minutes. 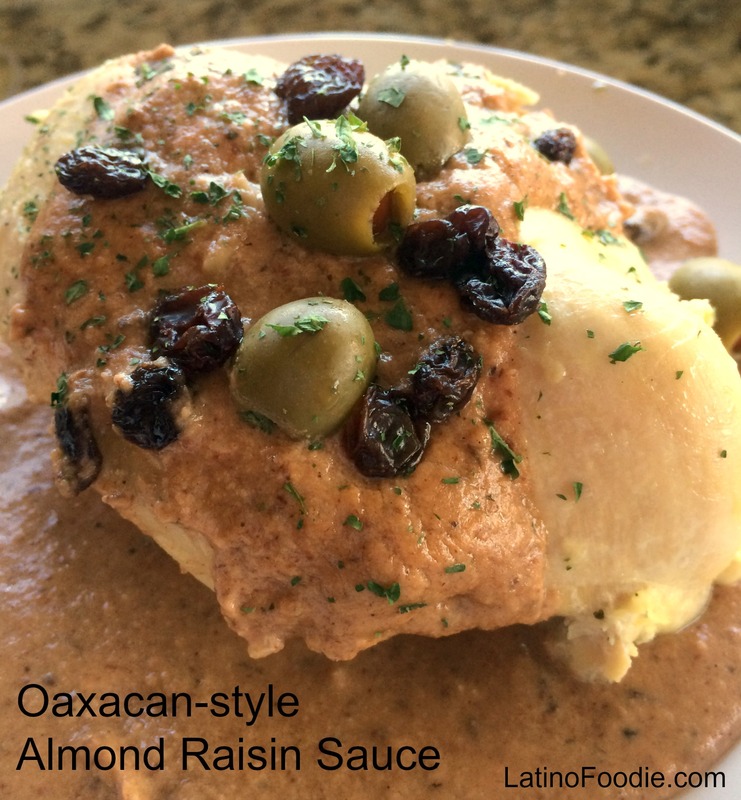 Put the chicken on plates and pour over the sauce and garnish with green olives, pickled chiles, raisins and almonds. Serve with a side of white rice and warm corn tortillas. For more information about all-natural, no-sugar added California raisins and for recipe inspiration, please visit www.loveyourraisins.com, or get social at www.facebook.com/californiaraisins. This is a sponsored post by California Raisins. The recipe and opinions are my own. Thank you for supporting the brands that make this blog possible.